The story follows Yona, the princess/ heir of the Kouka kingdom as she sets out on a journey to find four powerful beings known as the four dragons. There’s been a slight bump in the road for one of the royals of the Kouka kingdom that prompts Yona to seek out these dragons with the help of the King’s most trusted/ skilled soldier, Hak Son. In essence the anime is an adventure anime similar to Nanatsu no Taizai. Though not exactly the same as Nanatsu no Taizai, Akatsuki no Yona is a great mix of romance, action, comedy, sorrow and politics plays a big role in the back theme (if you’re into that stuff). At first glance I thought the anime would be a heavy rom-com reverse harem judging from most of the reverse harems I've seen so far, but Akatsuki no Yona is far more than a reverse harem; it's a close to perfect mirror of an anime depicting power in politics and rapid mental aging for characters like Yona. With an anime that deals with power and politics it's important to have pivotal characters that serve as fair ground to display this aspect. The Kouka kingdom has fallen into ridicule from citizens that the kingdom rules over and by the surrounding nations due to the ruling of the King which happens to be Yona's father. Here's where the politics come in. First important character is Su-Won, a cousin to Yona and a nephew to the King. He performs a task that shatters Yona to bits in the first episode in attempts to restore the once great Kouka kingdom. If you've seen the first episode you would know what Su-Won did, but for the purposes of my reviews I won't spoil it. At first I found Su-Won's acts in the first episode to be atrocious, but as the anime progressed and we saw the damage caused under the King's ruling and it made perfect sense to me why Su-Won did what he did. On the flip side we have Yona, a carefree princess torn into bits after witnessing what her cousin Su-Won did. Su-Won's actions drove Yona out of the kingdom and prompts her to find these so called "four dragons." To add a layer to the complexity, Yona is in love with her cousin which breaks her image of her highly praised cousin Su-Won. 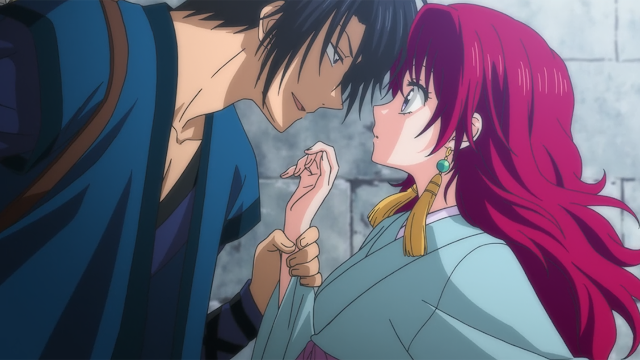 I wasn't a big fan of Yona at the beginning since I viewed her as this helpless princess, but that changed by the end of the anime when she grew a backbone and was able to cater for herself. Animation was okay. It wasn't something that bedazzled me or something that I appreciated. A couple of the stills were gorgeous, and the heavy action bits could have been shined up a bit more. The character designs were a bit wonky, and I felt as though most of the characters like Yona, Hak and the White Dragon could have used a bit more polishing. Music was not too bad as well though I didn't really pay attention to it. If you've seen any TVB dramas about the dynasty days when emperors ruled China, the music from those dramas reminded me of the OST of Akatsuki no Yona haha. Did I find the anime entertaining? Of course I did, the petite arcs between the four dragons were comical and fun to watch along with the flirty dynamic between Hak and Yona made it so bearable to complete. The only issue I have of Akatsuki no Yona as of now is that throughout 90% of the anime Yona's looking for these dragons, but at the same time she has no clue what she's going to do with them after she collected them all. Which is why there's a season two to find out Yona's plans to do with the dragons! Or at least that's what the ending of the first season suggests. I couldn't find any other problems other than Yona's premise, since I'm assuming there will be a second season I'm excited to see Yona and Su-Won once they get together and have a face to face conversation. Other than that I enjoyed Akatsuki no Yona very much. If you haven't seen it yet please give it a watch, it's not your typical rom-come injected reverse harem. And if you read my review or have already seen the anime, please post a comment below and tell me your thoughts! I watched the anime on recommendation from a friend and I absolutely loved it! I have to say that the manga goes a bit farther into what she's doing with the four dragons, though so far there really hasn't been any talk about what the ultimate endgame is going to be. If you like reading the mangas as well as animes I'd highly suggest it! On another note, I totally know what you mean about Su-Won. It's so hard to think of him as the bad guy when all the changes he's making are good, and that's another thing I love about this anime/manga; the "bad guys" are way more complicated and complex (yes, I know that was redundant xD ) than a lot of books and TV shows make out their bad guys to seem, as well as the "good guys." I haven't read the manga, but I might read it if you say it goes into more detail. I know! In the beginning I kind of disliked Su-Won but after a few episodes, if he's doing a better job as King then I understood why he did what he did. Even though I don't approve of what he did :P (Kinda weird). I guess we'll just have to wait for season 2 to see what happens.